Many times people will develop a fear of elevators. Typically this happens as a result of a bad experience either in and actual elevator or simply in a tightly confined space. An elevator can be particularly challenging to some because of its lack of windows, its small size, other people being present, and the possibility of a mechanical malfunction. Additionally, there are numerous movies depicting tragedies occurring in elevators. Whatever your particular aversion to elevators may be, this recording is designed to help you overcome it. Whether it is simply claustrophobia or something much worse this recording will assist you in achieving your goal of riding in an elevator in a very relaxed way. I have heard stories of people taking many flights of stairs rather than elevators due to their fear of elevators. This does not have to be the case with you. 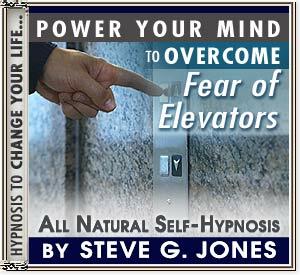 After listening to this recording and overcoming your fear of elevators, the only time you will be using stairs is when there is an absence of an elevator or if you simply want the exercise. In other words, you will have a normal and rational relationship with elevators.